(Nanowerk News) These days the core of the Milky Way galaxy is a pretty tame place...cosmically speaking. The galactic black hole at the center is a sleeping giant. Existing stars are peacefully circling. Although conditions are favorable, there doesn’t even seem to be much new star formation going on. But there is growing evidence that several million years ago the galactic center was the site of all manner of celestial fireworks. A pair of assistant professors – Kelly Holley-Bockelmann at Vanderbilt and Tamara Bogdanovic at Georgia Institute of Technology – have come up with an explanation that fits these “forensic” clues. Writing in the March 6 issue of the Monthly Notices of the Royal Astronomical Society, the astronomers describe how a single event – a violent collision and merger between the galactic black hole and an intermediate-sized black hole in one of the small “satellite galaxies” that circle the Milky Way – could have produced the features that point to a more violent past for the galactic core. 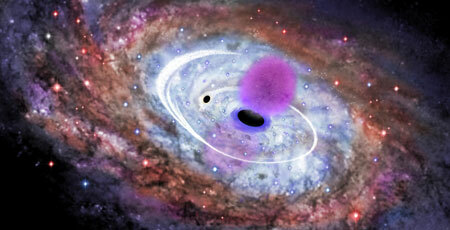 Artist's illustration of a satellite galaxy on a collision course with the galactic black hole. The most dramatic of these extraordinary clues are the Fermi bubbles. These giant lobes of high-energy radiation - caused by particles moving nearly the speed of light - extend some 30,000 light years above and below the Milky Way center. If they were glowing in visible light they would fill about half of the night sky. But they radiate X-ray and gamma-ray light, so you need X-ray vision to see them. The discovery was reported by astronomers at the Harvard-Smithsonian Center for Astrophysics. When she got home from the conference, Holley-Bockelmann recruited Vanderbilt graduate student Meagan Langto work on the problem with them. With the assistance of Pau Amaro-Seoane from the Max Planck Institute for Gravitational Physics in Germany, Alberto Sesana from the Institut de Ciències de l'Espai in Spain, and Vanderbilt Research Assistant Professor Manodeep Sinha, they came up with a theoretical model that fits the observations and makes some testable predictions. The violent gravitational tides produced by the process could easily have compressed the molecular clouds in the core to the super densities required to produce the young stars that are now located on the central black hole’s doorstep. It should be possible to detect these stars with large surveys like the Sloan Digital Sky Survey because these stars would be traveling at much higher velocities than stars that have not undergone this type of interaction. So discovery of a large number of "high velocity stars" racing outward through the galaxy would strongly support the proposed scenario of the Milky Way and satellite galaxy merger.